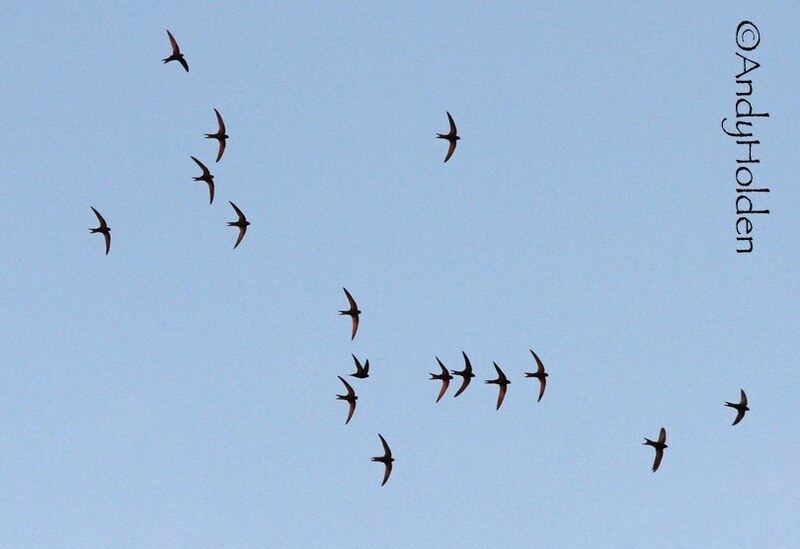 At least 16 Swifts counted hawking above the River, there could well have been more, but that's the minimum I counted. Also noted House Martins and Swallows. Swift movements in June are pretty erratic on the South Wales coast but when they happen, predominant direction is NE (following and mostly over the land) although some move SW (mostly out over the sea). Numbers are not large (50-100/h perhaps) so nothing like as spectacular as at some other places. More dependable movement are in late July when predominant movement is again NE. 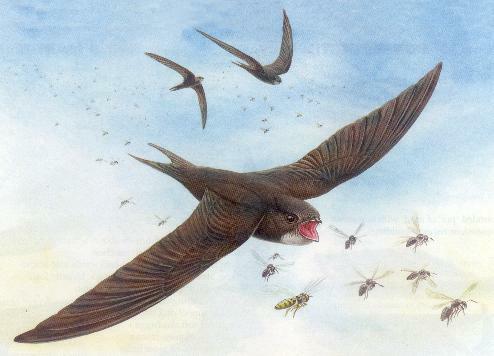 Swifts do seem to cross the Bristol Channel from time to time at the height of the breeding season. Last w/e for example, I had one coming in off the sea heading in from England’s green and pleasant land and another miles off shore heading SW well over the sea. Very occasionally, I have seen small parties apparently feeding well out over the sea… should probably not be too surprised perhaps as aerial plankton is fairly ubiquitous during the Summer. As you are aware Spurn does very well for swifts with numbers escalating to a crescendo in the beginning of July. The big movements here are on SW winds and can include a variety of other swifts. On a big day these are caught by flip netting. Nearly all are non- adult/non-breeding ( 2nd yr etc) birds- some scalloping is visible in good light. These birds are presumably taking advantage of the winds not only to fly but also to feast on insects brought up by updrafts. I suspect these roaming around according to the weather- so few in NE/N winds at Spurn and those that are seen go N. Presumably larger numbers re then taking a N route elsewhere in the country and then back S on a change of wind- i.e opportunistic movements of bachelor birds. Finally mid July onwards, the true migration and exit commences. 1000hrs - Just had a pair of Swifts high up whilst heading towards Heysham, about 3/4 mile past "The Battery Pub". 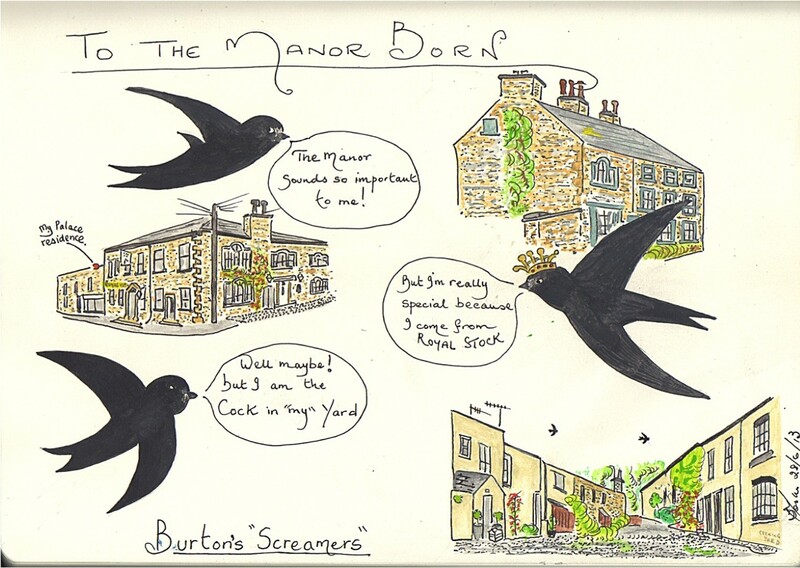 Also Swifts seen lately around the Carnforth centre areas. Friday 5th June 2015 - Main Street, Burton In Kendal 2100hrs to 2200hrs "New site on The Coach House"
Last night (5th June) was the first night this year of the Burton Swift study group activity, when four of us met up and gave a brief survey of the local Swift situation. Reg and I were present and it was great to welcome John and Paula who are new to the group. We saw about 12 birds flying semi high above the Burton Memorial Hall and Main Street. At times up to six birds were seen chasing one another whilst at the same time screaming in their familiar vocabulary! We moved on and started to observe the Manor House and we also managed to see a bird fly into the old established site near the corner of the gable end. This was good to see because we where not sure how things would turn out this year on account of there being scaffold there last year. So its looking good so far! 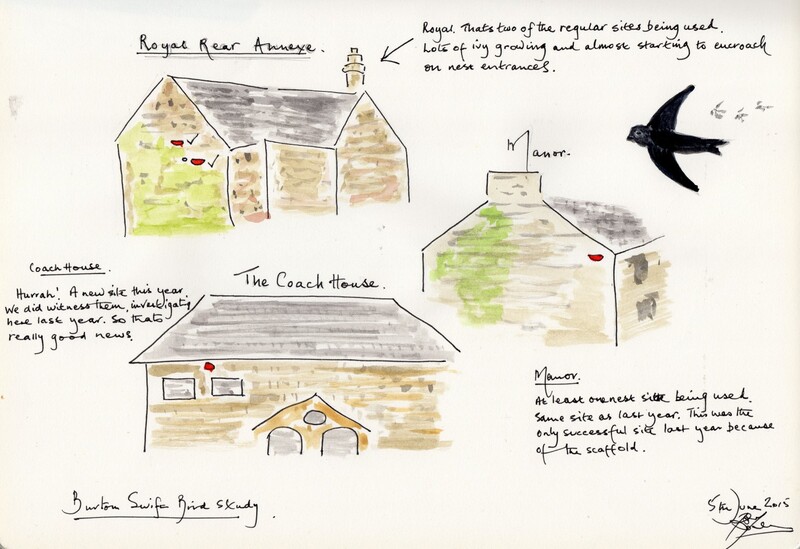 A lovely surprise to us all was when a bird was seen to go into a NEW site on The Coach House, and also another bird was seen also trying to access this same site. We did see birds canvassing this site last year, possibly none breeders last year and preparing their mind in readiness for this year and a absolute delight to see this new activity! Its still early days yet, but we have already decided that we will be meeting up again next Thursday 12th June at the Burton Memorial Hall at 2100hrs and anyone who wishes to join us would be very welcome.